Amalfi is situated right in the center of the Amalfi Coast and you can get here from both Salerno and Sorrento. From either town, Amalfi is a 30/40 minute drive away. Sita buses run regularly to Amalfi and, in the summer, sea connections are available from both Naples and Salerno. Italy's oldest maritime republic, symbol of the Amalfi Coast, continues to enchant visitors just like it did in the days of the Grand Tour. Just over three square kilometers of devastatingly beautiful scenery at the mouth of the Valle dei Mulini: this is Amalfi, a town which opens like a fan towards the sea, sheltered from behind by the steep slopes of the Monti Lattari. Amalfi's Ancient Roman origins are evident from a number of ruins, including those of a nymphaeum dating back to the reign of Emperor Tiberius. Amalfi is the oldest of Italy's four major Maritime Republics and prospered for a full three centuries under the Normans, Longobards and even the Saracens. Its decline began in 1137 when it was defeated and pillaged by the rival republic of Pisa. "For the people of Amalfi the day they enter Paradise will be a day much like any other: because for them paradise is already here on earth, right on their doorstep." The history of Amalfi has been shaped by the town's extensive commercial relations throughout the Mediterranean, and the great technical and scientific prowess of its citizens, such as the Amalfi-born Flavio Gioia, attributed with the invention of the nautical compass. Then there are the Tavole Amalfitane, which for centuries represented the maritime code in the Mediterranean. When, in the mid 1800s, Prince Ferdinand of Bourbon constructed the coastal road between Vietri sul Mare and Positano, allowing easier access to this beautiufl stretch of Italian coast, the town's mild climate and beautiful architecture made Amalfi an obligatory stop on the Grand Tour. Today, traveling to Amalfi over land or sea is still an unforgettable experience. Quintessentially Mediterranean, Amalfi's townscape is comprised of a cluster of little white houses, interspersed with narrow alleyways and shady porticoes, and watch towers such as the Torre Saracena, close to the Convent of San Francesco. The town's landmark is the Duomo or cathedral. Initiated in the 9th century and altered on various occasions, the church, preceded by an impressive flight of 62 steps, towers over Amalfi's main piazza. The multi-colored facade was completely rebuilt in the 19th century after the original collapsed. Work on the majolica faced bell tower was completed in 1276. The interior is a magnificent display of Italian baroque art and silver masonry. A bronze statue of Sant Andrea dominates the altar and protects the reliquary urn associated with the miraculous appearance of the manna, which the people of Amalfi commemorate each November 27th. From inside the cathedral, visitors gain access to the first Duomo of Amalfi, now called the Basilica del Crocifisso, and to the splendid Chiostro del Paradiso, built in the 13th century as a cemetery where the towns most illustrious citizens were laid to rest. Beware: if you are superstitious, dont climb up the steps of Amalfi Cathedral hand-in-hand with your loved one: according to the local legend couples who do so will never get married. Beyond the Piazza del Duomo, at the center of which the 18th century Fontana del Popolo takes pride of place, visitors reach what remains of the ancient arsenals where the marine republics war ships were constructed. Just a few steps away there is the pretty little Piazzetta dei Dogi, lined with typical shops. In the vicinity of what was once called the Vallenula, the old western gateway to the city, is the 10th century Church of San Biagio, which is famous for its precious late 18th century majolica floor. The Valle dei Mulini and the Vallone delle Ferriere. 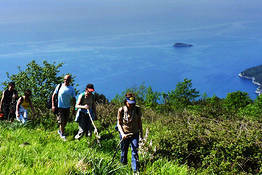 From Amalfi to Atrani, along the Via delle Signore footpath. No visit to Amalfi can be considered complete without having enjoyed a stroll through the town's labyrinth of little lanes and alleyways or a trip to the Paper Museum, in Via delle Cartiere 24, in the historic Cartiera Milano. The production of hand-crafted paper, known as bambagina, is one of the oldest of Amalfi's traditions and today remains part of the town's culture and identity. Those looking to purchase a few sheaves of the paper can do so in the 500 year old Cartiera Amatuda, close to the Canneto river in the Valle dei Mulini. Amalfi's twin appears like an enchanting nativity scene made up of a maze of little alleyways, narrow flights of steps and houses clinging to the rocks. A fishing village, the history of which is inextricably linked to that of its illustrious neighbor, Amalfi, and which has conserved its ancient medieval structure, comprised of a cascade of houses interspersed with steep flights of steps, covered passageways, and tiny gardens, all incredibly intact. Clinging to the cliff face, directly above the sea, at the mouth of the Valle del Dragone, Atrani is the smallest town in the whole of Southern Italy. The Dutch artist Escher came to the Amalfi Coast in 1923 and immediately fell head over heels in love with Atrani; immortalizing the game of light and shadow played amidst its narrow alleyways in a great number of his artworks. Today, the Amalfi Drive has formed a barrier between the town and the sea, and those wishing to reach the water's edge have to use one of the passageways such as that in Piazza Umberto I, originally constructed as shelter for boats during high tide and which now appears like the back stage of a theater, facing the sea. The '''Church of San Salvatore del Bireto', where the coronation of the Doges of the Republic of Amalfi once took place, is located here. Another place to visit, if only for its incredibly panoramic position, is the majolica domed Collegiate Church of Santa Maria Maddalena which dominates the entire eastern side of the town. Close to the church is the 'Grotta di Masaniello.' According to the local legend, the revolutionist sought refuge in this cave, which is near to his maternal home. Enjoying a fabulous view over the whole of Atrani, the 11th century Church of Santa Maria del Bando, set against the rocks beneath the Torre dello Zito, is particularly enchanting. Santa Maddalena, patron saint of Atrani (22 July). Reenactment of the Ducal wedding (April). Sagra del pesce azzurro (August). Fresh fish is a major protagonist in almost all of Atrani's gastronomic delicacies, including those served in the intimate Osteria da Luisella, in Piazza Umberto I, or the A Paranza restaurant in Traversa del Dragone. Typical dishes which are not fish-based include the sarchiapone, a marrow stuffed with meat and cheese cooked in tomato sauce, the custard and cherry filled pasticciotto, and the wickedly sweet casata atranese. For a lunch on the beach: Lido Azzurro, offering light and fresh fish and seafood dishes. For a gourmet dinner: Da Savor under the porticos of tiny Atrani or Da Gemma in the center of Amalfi. For traditional cooking: Da Ciccio cielo, mare e terra. Try their famous "spaghetti al cartoccio"!